Dozens of protesters who came out in support of the rebels are wounded in clashes with Indian security forces. Srinagar, Indian-administered Kashmir – Four civilians and an Indian soldier were killed in a gun battle in southern Kashmir, sparking mass protests across the region in which dozens were wounded during clashes with security forces. Inspector General of Police Swayam Prakash Pani told Al Jazeera on Wednesday the civilians were killed in the crossfire after soldiers confronted the rebels. “One army soldier has been killed and two are critical,” he said. The gunfight started in Khudwani village of Kulgam district at midnight on Tuesday, Pani said. In the first such incident in recent years, the rebels managed to get away despite the heavy presence of security forces. The state’s police chief, Shesh Paul Vaid, told Al Jazeera the rebels apparently didn’t suffer any casualties. “When the forces withdrew from the site, no bodies were found and it seems they managed to escape,” Vaid said. After news spread of rebels being pinned down in a house, hundreds of residents marched towards the clash to help the fighters escape, which triggered violence between civilians and Indian security forces. “I have never seen such scenes in my life. It looked like destruction all around,” Mohammad Younis, a Kulgam resident, told Al Jazeera. “There was [tear gas] shelling everywhere and everyone was protesting on the roads. There were men, women, children – almost everyone,” he said. Dr Zahoor Ahmad at a nearby hospital said wounded were still arriving. The government ordered the closure of schools in southern Kashmir as hundreds of students held protests. Separatist leaders in the region called for a complete shutdown in the region on Thursday to protest the killings. Mirwaiz Umar Farooq, who heads a faction of the All Parties’ Hurriyat Conference, tweeted “houses and shops are being blown up by explosives”. “Appeal UN and the international community to step in as the situation is dire,” he said. Al Jazeera couldn’t independently confirm Farooq’s comments. 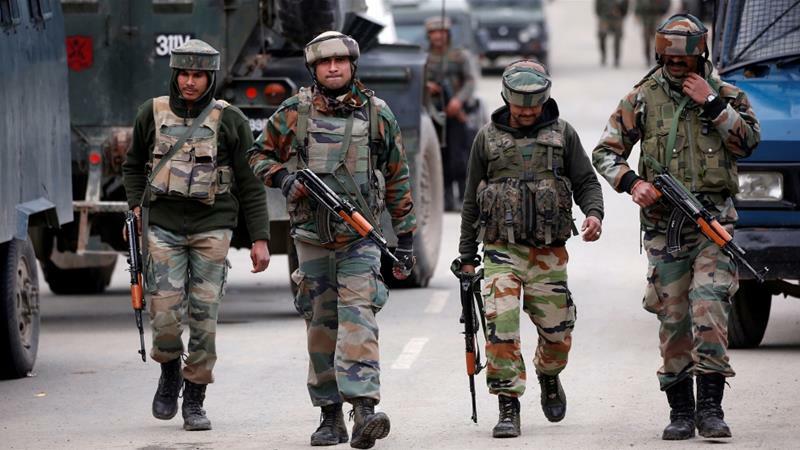 Kashmir is one of the most militarised regions in the world with thousands of Indian soldiers and paramilitary personnel engaged in a fight against armed rebels. Tens of thousands of people have been killed in the decades-old conflict. The latest firefight comes amid multiple counter-insurgency operations in southern Kashmir, which have ended in violence and the killing of civilians. Kulgam is adjacent to Shopian district where 13 rebels, four civilians, and three soldiers were killed on April 1 – one of the bloodiest days of the conflict in recent years. The intensity of civilian support for rebels has increased in recent months. Residents have tried to help trapped fighters by pelting Indian security forces with rocks and stones. Anti-India sentiment runs deep among Kashmir’s mostly Muslim population after decades of Indian rule.